Dino Ndlovu has won a recall to the South Africa squad for their African Cup qualifying double header against the Seychelles. South Africa stuttered to a 0-0 draw at home to Libya in their previous fixture and are hoping Ndlovu will help provide the goals to lead them to victory. 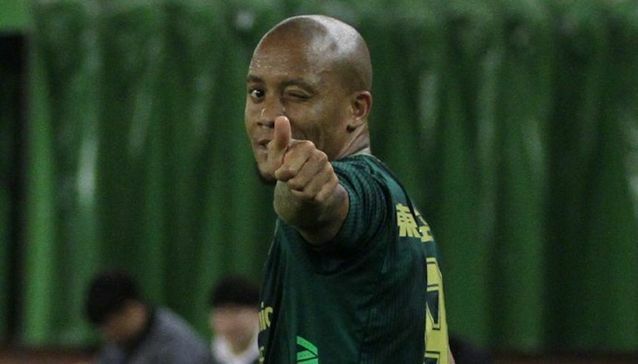 Ndlovu is considered to be a journeyman striker by the BBC who point out that he has played for clubs in Cyprus, Azerbaijan, and Israel and now plays his football in China’s second tier with Zhejiang Greentown. Ndlovu has been in fine form for his club side so far this season, scoring 18 goals in 20 games for Zhejiang Greentown to push them into a promotion fight. This is the kind of form that has seen him brought back into the frame for South Africa, with the Bafana Bafana manager Stuart Baxter think he could be the attacker to get South Africa back among the goals. Ndlovu’s last cap game a year ago in a World Cup qualifier against Burkina Faso when he made a brief substitute appearance. This time round he will be looking to make a bigger impact and hopefully win a regular role in the national team setup. South Africa will play a double header home and away against the Seychelles in the next international break in their quest to qualify for the African Nations Cup. The Seychelles could be the kind of opposition to give Ndlovu the chance to shine as they are far from the elite sides in Africa as you could possibly get.